There is something very good about a book that can draw you into the story in the first chapter. It wasn't anything out of the ordinary that happened, a silly mutt had gotten away leaving it's family to locate it. 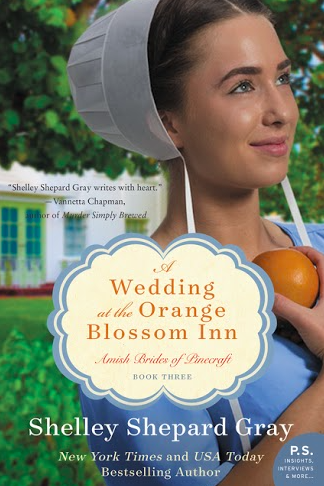 But Shelley Shepard Gray with her straight-forward style and the way that she reveals enough about the characters to pique your interest, pulled me right into her new book, A Wedding at the Orange Blossom Inn. The book takes place in Pinecraft, an Amish community nestled in Florida. For those that have read earlier books in the Brides of Pinecraft series, it revisits old characters and introduces many new. For those that are new to the series, there is nothing lost in having not read the earlier books. The story is universal in it's storyline, the chance meeting, the common challenges, the shared issues and the opportunity for more, despite the unique setting and Amish characters. I think that is one thing that really appeals to me about this book (and others like it). Although it is Amish fiction, and their religious ways come into play, at the heart the stories are about people and emotions, something that we can all relate to. Gray does a great job developing the characters in the book and the reader is easily pulled in and watches as they open themselves up and close back down in worry, as they grow from experiences and come to discover that there is more out there, as they find love and worry about losing it. If you are looking for an easy, enjoyable love story to read, you should definitely consider A Wedding at Orange Blossom Inn. I really love stories about people who find love again after a tragedy and these are my favorite movies and books to read. This book looks so interesting and good to read! My Mom is a big reader and of course loves romance books. This sounds like a good book and one she would enjoy.